This app is a huge help in choosing the right colors for your artworks. 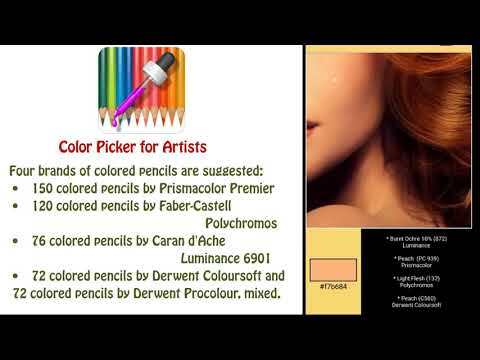 Four brands of colored pencils are suggested when you pick the color from your reference photo: 150 colored pencils by Prismacolor Premier, 120 colored pencils by Faber-Castell Polychromos, 76 colored pencils by Caran d'Ache Luminance, and 72 colored pencils by Derwent Coloursoft with 72 colored pencils by Derwent Coloursoft. Option for graphite included. Bonus feature: downloadable, printable Skin Tone Value Viewers for drawing portraits. This app takes less than 8 MB on your space, and works without Internet. App is developed and published by the Colored Pencil Artist, Jasmina Susak.